Need home (structure) advice. Is this going to fall apart? I think Tom is a first time buyer? What might be trivial for some of us (not for me), is probably not the way to go for a novice.....with a life . Unless this board guides his way....seriously! The brick is a facade, so not structural. The issue I have is the brick being loose is water entry and mold. That window also does not look properly installed. 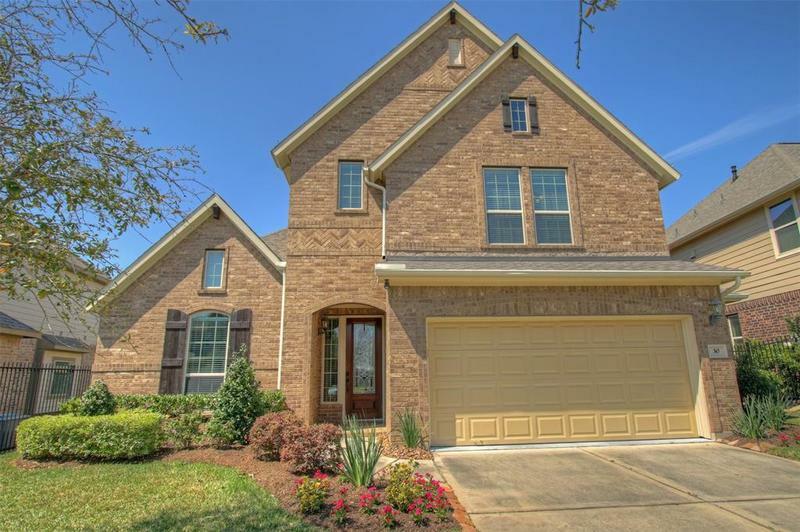 One thing to consider is that builders generally do not provide adequate foundations, or any serious engineering into their design, so I would always be wary of houses that are perched on sloping lots and also any house on soil that has a high clay content, particularly in a climate like Texas, or you have hot dry summers. Even though the brick on that house is a veneer, if it been built properly you would never see a problem like that. My house was built 45 years ago and doesn't have a single crack anywhere in the brick façade. Last edited by javadog; 10-05-2018 at 04:42 AM..
We all agree that it was not built properly. Unless they are seeing cracking elsewhere, I doubt the problem is a foundation. I expect it is simply poor construction. And with the water entry, mold is assured. With our humidity, mold is always present. but with water entry, it will be all over that internal area. There have to be other houses around without the issue in Wolf-Boy's (Wolf-Man now?) price range. Hey Tom, we need to get out for an Astros game! I think the triangle shaped brick at the bottom is strange. Something weird about it. It's a decorative course of brick that runs the length across the garage roof and continues around the house. Look at the other picture. Here you go. 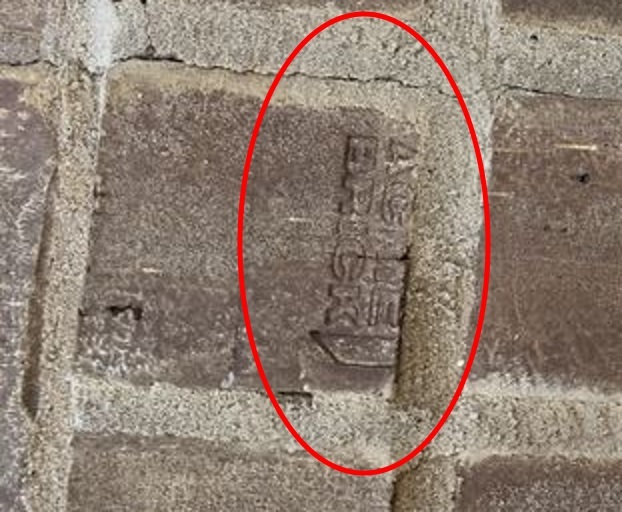 All brick imprints are supposed to face inwards so they cannot be seen. This was a poor job. And the installation of the windows was poor as well. SO and I are looking to purchase a house. House was built in 2013 and from outward appearances all seemed well before putting down earnest money. 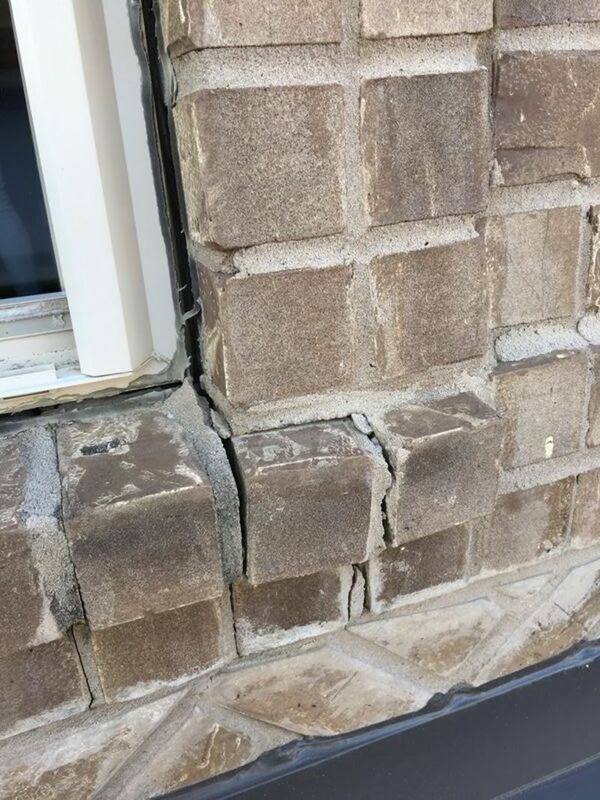 Home inspector found that the exterior brick below the window was loose and the cracks/gaps had formed. I am not an engineer, but I probably slept with his girlfriend during school. I understand that this could be a settling issue, but want to know the PPOT brain trust thoughts. David(125) want to take a spin up to the Woodlands and check it out? We have until Wednesday of next week to either terminate the contract or proceed with the sale. Without further ado.... picture time. Give me a call, if you still have my cell phone. I could take a run out and look at it. I agree. I wasn't mentioning the foundation as a cause for this damage but simply adding to the things he needs to look for. I wouldn't look at ANY house built on a slope, or on clay soils. In addition to your mold fears, I'll add that water intrusion will also destroy the integrity of any wood structure if enough time elapses. Cracks of that size can allow significant water entry. 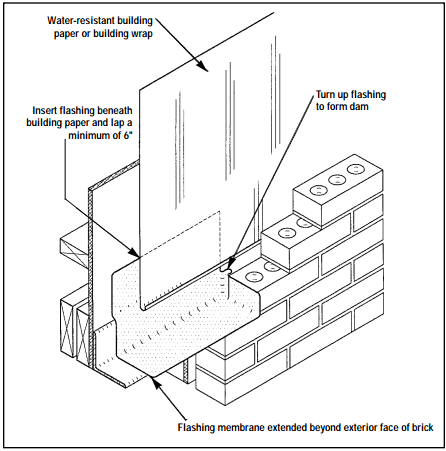 - Brick appears inadequately supported, and/or wood beam and/or foundation has settled. Look for cracks/bowing/sloping on the slab in the garage. - There will be water intrusion. But the level of damage is TBD and that would be my bigger concern -- is there structural rot in the wall/window/roof/ceiling? 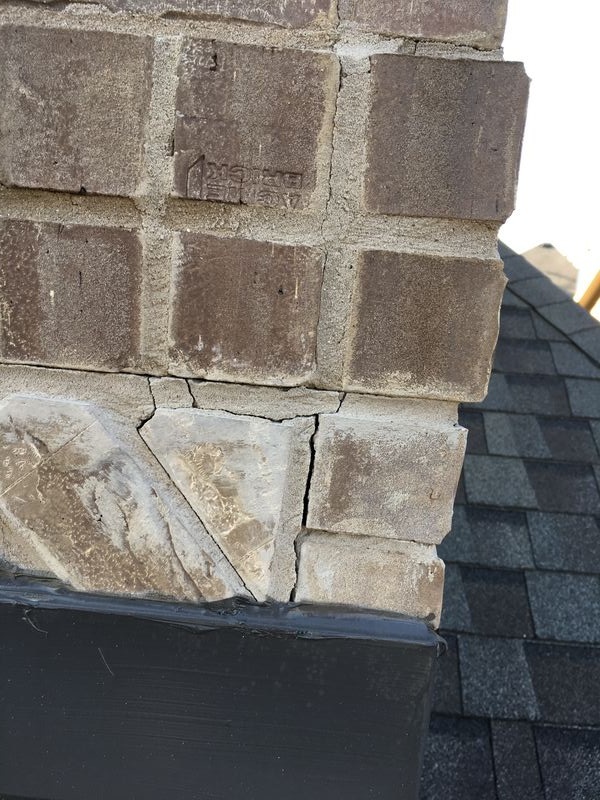 Brick cracks are actually pretty easy to repair (assuming you've got adequate support below). Water damage is cancer. If you (or the seller) decides to fix it and you need a "brick guy," PM me as I can make a recommendation of one I used -- I've successfully had worse brick cracks repaired and it looks good and has held up great many years later. But I already owned the problem -- if the house you're looking at isn't otherwise special (or deeply discounted), I'd keep looking for one that's better built/maintained. Run, don't walk, away from this one! I'm a structural engineer (but I didn't stay at a Holiday Inn last night) and investigated 1000s of these type problems over the years. It appears, the wall with the window is set back further than the front garage wall, right? So there has to be some sort of beam just above the garage ceiling and directly below that wall that span across the garage. It will not be visible without cutting the drywall garage ceiling. That beam is the likely problem - it is probably a double LVL or maybe a glulam. If it is only a double or triple 2x12 it is surely undersized and improperly nailed and is a sign of poor quality construction that may also be present in other hidden areas of the home. 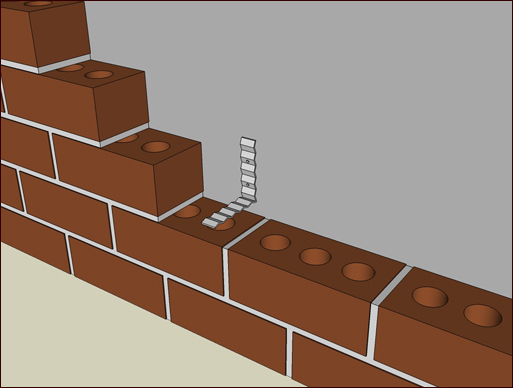 If the beam is OK, then it's the lintel directly supporting the brick like previously mentioned. These LVL beams (and even steel) are often improperly sized by the guy at the lumberyard counter from a spec book, and not understanding that there is a significant amount of deflection (sag) allowed when the beam is used for a floor or roof (which is what the standard charts are for). Obviously, brick cannot flex and a much stiffer beam is required. Hopefully, your engineer brings a drywall saw, or at least , a borescope and drill to see what's above the garage ceiling. This is not a foundation problem. Nothing is going to collapse. It's sort of a nuisance type failure but will be a constant leakage source. As an architect, I am in agreement with the group here. While this issue may be fixable from an aesthetic standpoint, given what appears to be open joints, there is the potential for mold in the wall. 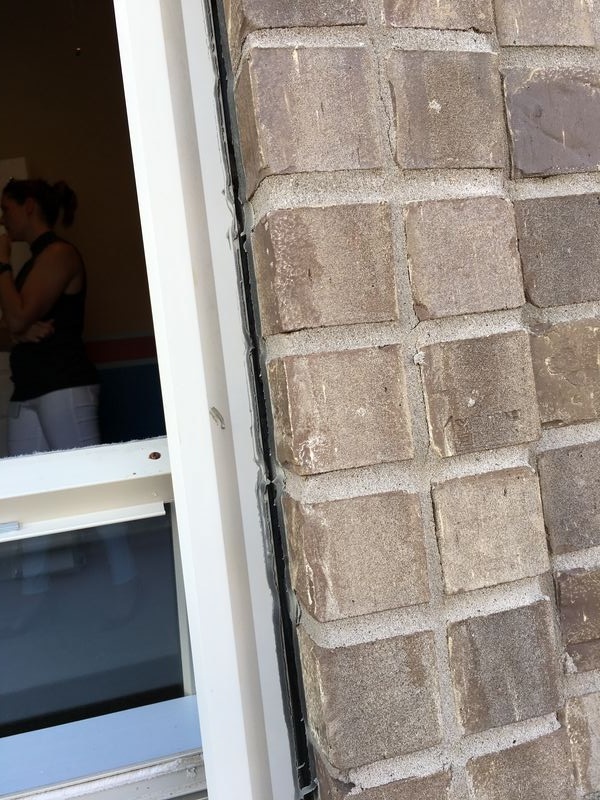 Not with standing that the brick is just a decorative element, given the sloppiness of the brick install it is likely there are holes in the underlying water proof membrane that would allow moisture in the wall. The only way to determine that is to pull the finish from the inside, remove the insulation and look at the sheathing. If there are other houses in the area that are better built, then go there. These problems are solvable, you just need to go into understand the full extent of what repairs might be and requesting reasonable accommodation to determine if a problem exists. If you pull the drywall interior finish, say a 2 foot square and find no mold, the only harm is a patch and some paint. Sort of like the PPI on my clone. Inspector thought there was damage to second gear synchros, so we negotiated pulling the motor and trans. He paid for that, and if there was no damage, then that was the only concession he made. 35 ys in business. 2nd generation builder, father was 3rd generation mason. There should also be weep holes where the brick meets the foundation. there is NOTHING behind a single layer of brick ? no tie to the stick built wall at all ? Last edited by nota; 10-05-2018 at 08:53 AM..
Just what I was going to write. Most likely undersized beam above the garage door. Send me a text and let me know where, I'll come look with you if I can. Although this may be a house to pass on. When they built our house with a brick veneer, they used sheet metal anchors. Not sure how strong they really are though. how many anchors are used by code ? If they used dimensional lumber to make their own support for that wall, something I see all the time (especially in headers) that will have shrunk since the house was built and their 2x12s might only be 11 inches wide now, as opposed to the 11.5 inches they likely were when installed. That's enough shrinkage to cause that problem. I'd find another house, that one will have more problems than just the one you see now. Who knew PPOT would be full of builders and fashionista's? Don, we had already picked out where the 300 bottle wine fridge would go. Or the spare bedroom for you to come and enjoy Houston's finest. So, who is wearing the white pants. Your answer will guide my follow up post. If she is your SO, nice job. If she is the realtor, nice job.